Warsaw - UEFA on Tuesday said it had fined the Croatian Football Federation €80 000 after its supporters racially abused Italy's Mario Balotelli. European football's governing body said the fine was imposed "for the setting-off and throwing of fireworks and the improper conduct of supporters (racist chants, racist symbols)" at last Thursday's Group C match in Poznan, western Poland. "An appeal can be lodged against this decision within three days of the dispatch of the reasoned decision," a statement on the organisation's website said. The case was being eyed closely given UEFA president Michel Platini's repeated assertion that they have a "zero tolerance" to any racism and football-related violence. Platini this week also expressed outrage at the situation, telling reporters that he had warned the Croatian football federation about the possibility of racist chanting last year. Comparisons will inevitably be made to the €100 000 that UEFA ordered Denmark's Nicklas Bendtner to pay for showing the sponsored waistband of his underpants during a goal celebration. Bendtner was also suspended for a match. That incident, in Denmark's Group B match against Portugal last Wednesday, flouted rules governing player conduct and advertising rules. The online betting firm whose name was on Bendtner's underwear said on Tuesday it would pay the fine. Croatia had been expecting a heavy penalty after the same UEFA committee last week imposed the threat of a six-point reduction on Russia's next European championship qualifying campaign. That followed the throwing of missiles and fireworks at their opening Group A match against the Czech Republic on June 8. Four stewards also required hospital treatment when they were set upon after the game, which Russia won 4-1. The case against Croatia was the first for racism in Euro 2012 and followed separate claims that Spanish fans racially abused Balotelli, who is of Ghanaian origin, and that Russian fans taunted the Ethiopian-Czech Theodor Gebre Selassie. Dutch players also alleged they heard monkey noises during a public training session in Krakow, southern Poland, although no official complaint was made and the local authorities denied the claim. Croatia were reported to UEFA after a racism monitoring body said that up to 500 fans were involved in racist chanting throughout the match in Poznan, western Poland, which finished 1-1. An AFP photographer positioned in front of the majority of Croatia fans also said he heard the taunts against the Manchester City player and at one point saw a steward pick up a banana from the pitch. Croatia coach Slaven Bilic condemned those responsible and called for them to be banned from soccer. The federation distanced itself from the incident but called on UEFA not to penalise the team for the actions of a minority. 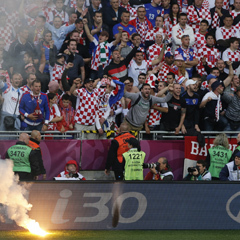 Croatia had previously been fined €25 000 after fans lit flares and let off smoke bombs during their opening match against the Republic of Ireland, also in Poznan, on June 10. In the Balkan nation's final match against Spain on Monday night, referee Wolfgang Stark briefly stopped the match after fans hurled a burning flare in the crowd and smoke billowed across the pitch.